TfL announced their intention to close every ticket office on the network back in 2013, but only this month has the actual closure programme begun. Remember all the noise and fuss there was when the news first broke, carefully coupled with the big Night Tube reveal to act as cover? Now listen to the deafening silence as the axe finally falls. A few news outlets mentioned the first closures in passing, notably the Wimbledon Guardian because South Wimbledon was top of the hitlist. But the public seem to have got all the anger out of their system fifteen months ago, long since replaced with a sense of resigned capitulation. Whatever everybody else said, TfL were resolutely consistent in their intention to close every single ticket office on the network. No ifs, no buts, no rolling over in the face of repeated strike action, just the firm restatement that no really, every single one would be closing. And as with so many seemingly immovable decisions, eventually the unions grew weary of shouting at a brick wall and the public lost interest and looked elsewhere. Because management have long been absolutely certain that Transforming The Tube was the future, they started extinguishing ticket offices years back. For example, when Wood Lane station was opened to serve Westfield London in 2008, no ticket office was included, only a wall of machines. When Cannon Street reopened after a major makeover last year, tickets were available only from TfL's new improved prototype machines, rolling out at a station near you soon. And when Tottenham Court Road opened its flash new Crossrail-friendly entrance last month, the lack of a ticket office earned barely a mention. Design them out early, that's been the plan. Only two* ticket offices are on the closure list this month, and they're not big ones. One is Queensway, in a part of the West End popular with suitcase-lugging tourists, and the other is South Wimbledon. Neither is a big-hitter with public opinion on its side, indeed both were probably selected to ensure that closure processes were workable on a small scale before being rolled out elsewhere. Next month another ten or so join the list, and then in the period April-June this number ramps up sharply to seventy-something. It'll be the end of the year, we're told, before the last ticket office finally succumbs. But by picking off a tiny number first, the masses closing later are merely part of an ongoing program and no longer news. * This week Covent Garden's ticket office closed permanently too, by default, as the station switched back to exit only while some lifts are upgraded. Several outer London stations with minimal passenger flows lost their ticket offices some years back. Chigwell, Roding Valley, Theydon Bois and Upminster Bridge are in the Underground's top ten least used stations, hence almost nobody minded when the staff there were kicked out of their little cubbyholes and the shutters brought down. The same set-up's coming to Oxford Circus and every other station soon enough. TfL's publicity machine is keen not to mention ticket office closures. They're focusing instead on "modernisation", and the benefits that bringing staff out from behind the window will bring. Hundreds of jobs are being lost, and not every station will see extra staff, but TfL aren't particularly keen to mention this either. "In the future, all stations will be staffed from the first to last Tube" they say, cunningly misdirecting passengers away from the fact that this is already the case. "We are moving our staff into ticket halls where they are more visible and can assist you more effectively" they say, and this may indeed turn out to be true. Why not pop down to Queensway or South Wimbledon today and see how the redeployed staff are adding value? TfL's official list of ticket office closures isn't headed "Ticket office closures", it's titled "Ticket hall scheduled improvement work". The marketing team of any organisation always looks on the positive side during a corporate restructure, because this helps to make enormous changes sound more palatable. TfL's "improvement" list chooses to focus on when stations are having their ticket offices functionally tweaked, and approximately how many months this will take. Most offices'll only take a month to become whatever they're going to be next, which might be a closed-off room or a knocked-through space with additional machines. Some stations like Gloucester Road and Mile End are pencilled in for 3 months, presumably because something seriously major is going to happen, while others are down for "1-3 months", which presumably means nobody's thought this through yet. Meanwhile Green Park, Baker Street and Russell Square have hit the jackpot with the maximum transformation period of 4 months, so expect something pretty wow afterwards, or maybe just a new Starbucks. Although TfL announced each station's transformation date in a list late last year, they've only ever published the month of closure, not the day. 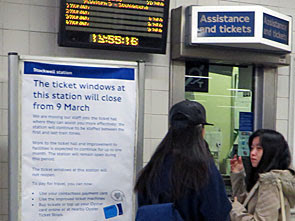 The first that regular station users know of the precise moment is the appearance of a board by the ticket window a couple of weeks before Doomsday - that's Stockwell's in the photo at the top of this post. By carefully controlling the information like this it's harder for the general public to focus any kind of campaign against specific closures, or indeed to even care. Six particularly busy stations may be losing a ticket office, but they're gaining a Visitor Information Centre. This isn't just the same old ticket office tweaked a bit with a different name, this is recognition that visitors to London will still need personal attention, and that an office with a counter is the best way to deliver this. King's Cross is first up, with a remodelled VIC up the St Pancras end complete with colourful curves and Post Office style queueing, and scheduled to open this month. Following by the summer will be Liverpool Street, Victoria, Heathrow 123, Euston and Paddington. But that's your lot if you want counter service in the new world - either join the hideously long tourist queue or give in and use the machine. Actually, not every station is losing its ticket office. Some are more Overground than Underground, so won't be culled immediately as part of this customer-facing transformation. Hence Gunnersbury, Harlesden, Harrow & Wealdstone, Kensal Green, Kenton, Kew Gardens, North Wembley, Queen's Park, South Kenton, Stonebridge Park and Wembley Central, along with Finsbury Park, are all on the closure list as "Timing to be confirmed". More long-termly, Barking, Ealing Broadway, Richmond, Upminster and Wimbledon aren't TfL-operated, so will be carrying on as normal unless their operating rail company chooses to pull the plug. If you still want to talk to a member of staff through glass, you know where to go. Most Londoners haven't used a ticket office in ages. Only a small proportion of journeys start at a ticket window, and your Oyster card or contactless card probably functions perfectly well without the need to queue. And OK, so there'll be times when a machine can't cut it and human interaction will be required, in which case a member of staff "equipped with handheld mobile device" will be around to provide "up to the minute information". But if you've ever used the DLR, which has been pretty much ticket-office-free for decades, you already know deep down that we'll all cope.